PM Group, the International project delivery specialists, was delighted to receive the South Dublin Chamber CSR Award 2016 at a ceremony in Dublin recently. “We were really pleased to be recognised for our contribution to the local community in South County Dublin. We tend to focus on two main areas – education and probono services – which is where we feel we can provide the greatest support. The opportunity to give something back to our community is something we all really value and are passionate about,” said Cathriona Fitzsimons, CSR Co-ordinator, PM Group. For the past five years, PM Group has played an important role in Engineers Week for South Dublin, where attendance at local educational events has increased year on year and in 2015, over 2,000 local kids took part. PM Group is also a significant contributor to the Junior Achievement programme designed to encourage children to remain in education for longer and develop skills for a future in the workplace. In 2013, PM Group began working with Tallaght Hospital providing probono architecture services and has completed two important respite areas for families, relatives and staff in the busy William Stokes Unit and Paediatric Emergency Department. PM Group architects were delighted to be in a position to offer their expertise to support the local community in Killinarden by developing a scheme for a new clubhouse for local football club Sacred Heart; to a local adult education centre aiming to eliminate poverty through education, An Cosan; donations to local charities including Cheeverstown, St Vincent de Paul and Merrick House. The South Dublin Chamber Awards is sponsored by South Dublin County Council, Google, Noel Group and AIB, amongst others. 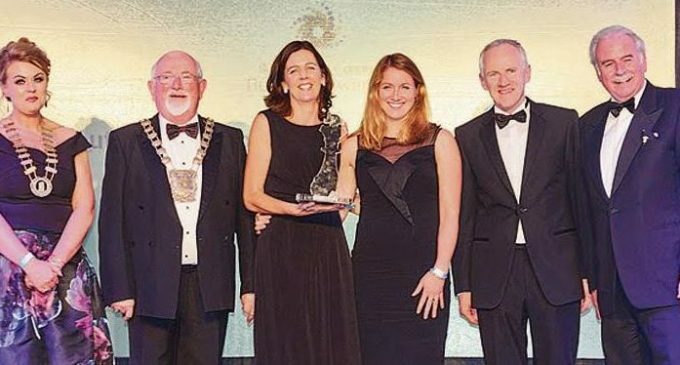 Pictured at the awards were: Mayor Sarah Holland; Mayor Gus O’Connell; Cathriona Fitzsimons and Mags Dalton, PM Group receiving the South Dublin Chamber CSR Award from guest presenter Marty Whelan.